2010 – The Hottest Year on Record: Is this a Cause for Concern? The GISS Land Ocean Temperature Index (LOTI) data up to January 2011 are shown in Figure 1. They are compared with the global warming models presented by Hansen (2006). The blue line in Figure 1 denotes the GISS LOTI data and Scenarios A, B and C describe various CO2 emission outcomes. Scenarios A and C are upper and lower bounds. Scenario A is “on the high side of reality” with an exponential increase in emissions. Scenario C has “a drastic curtailment of emissions”, with no increase in emissions after 2000. Scenario B is described as “most plausible” which is expected to be closest to reality. The original diagram can be found in Hansen (2006). It is interesting to note that, in his testimony to US Congress, Hansen (1988) describes Scenario A as “business as usual”, which somewhat contradicts his “on the high side of reality” statement in 2006. It is evident from Figure 1 that the best fit for actual temperature measurements is currently the emissions-held-at-year-2000-level Scenario C. The current temperature anomaly is 0.61 °C. Therefore, even with temperatures at record highs, we are not experiencing the runaway temperatures predicted for the “business-as-usual” Scenario A. Indeed, for Scenario C with emissions curtailed at year-2000 levels, the rate of temperature increase is an insignificant 0.01 °C/decade. It is also worth noting that we are currently at the lower end of the range of estimated temperatures for the Holocene optimum and the prior interglacial period. These occurred without human intervention or huge increases in carbon dioxide. 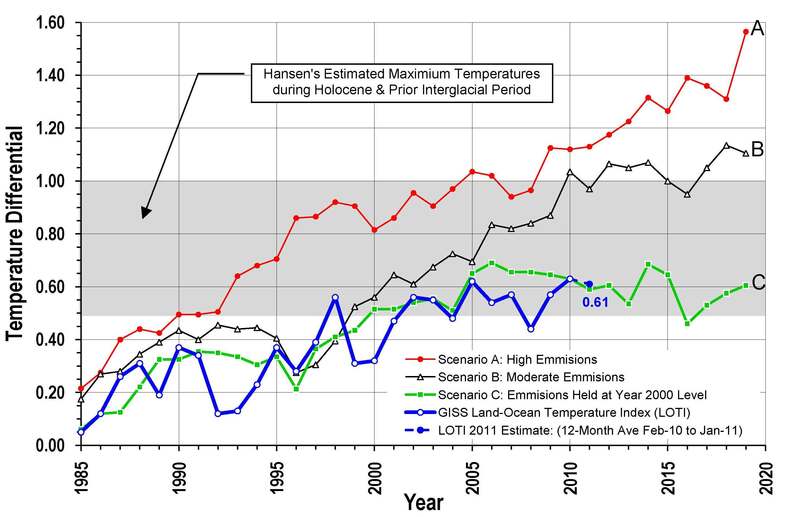 The above comparison based on Hansen (2006) uses relatively old climate models. Therefore, I have compared current HadCRUT3 temperature data with the latest IPPC AR4 (2007) models in Figure 2. Figure 2, which is based on IPCC AR4 Figure TS.26. I have added the HadCRUT3 data as blue dots. The black dots in the original TS.26 diagram appear to be HadCRUT3 data but are slightly misaligned. Therefore, I offset the HadCRUT3 data by adding 0.018°C to achieve a reasonable fit with the individual data points shown in AR4. The blue line with white dots the smoothed HadCRUT3 data. It is evident from Figure 2 that the smoothed curve gives an excellent fit with observed data presented as the solid black line in AR4. The current temperature anomaly is 0.52 °C. The observed temperature trends in Figure 2 are significantly below the “likely” warming scenarios presented in AR4. 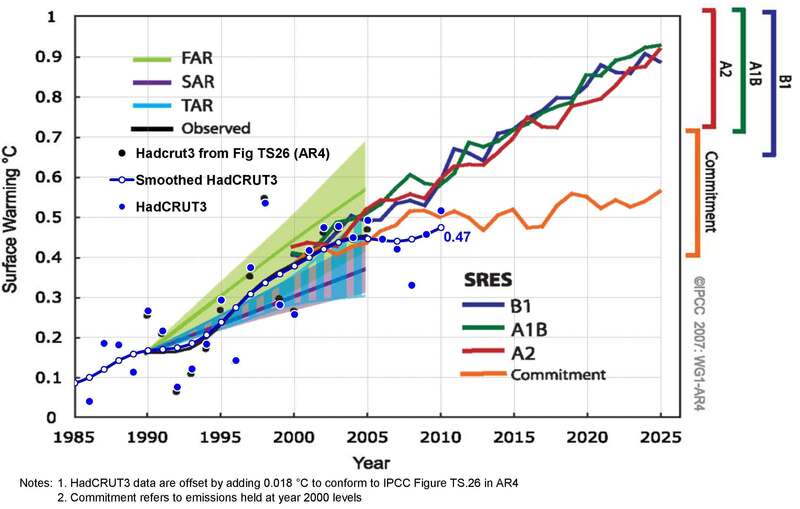 Furthermore, as with the GISS data, the current HadCRUT3 trend is similar to the emissions-held-at-year-2000-level scenario. Observed temperatures are significantly below the “most plausible” or “likely” high emissions scenarios. 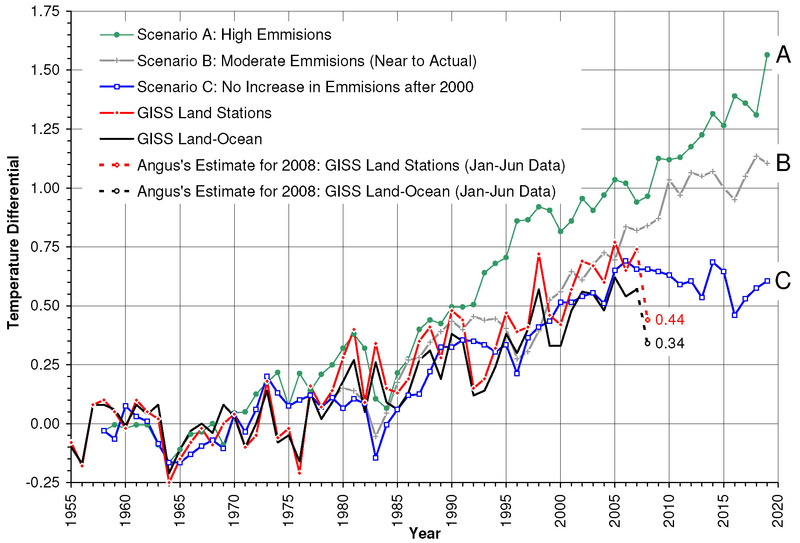 Instead, they are on a trajectory that is similar to the emissions-held-at-year-2000-level scenarios. Current temperatures are at the lower end of the range of estimated temperatures for the Holocene optimum and the prior interglacial period. These temperatures occurred without human intervention. In summary, global temperatures may be reaching record highs but they are not following “runaway” trajectories suggested by computer models. Instead, they are following an insignificant warming trend of approximately 0.01 °C/decade. Notwithstanding the above, it should be noted that time period for the comparison of actual temperature measurements with those predicted by computer models is still relatively short. Hansen (2006) suggests that we could expect reasonable results for distinction between the scenarios and useful comparison with the real world by 2015.